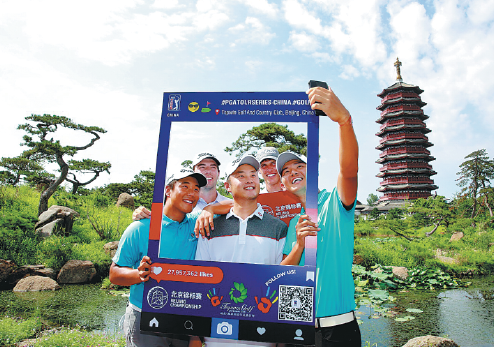 From left: Motin Yeung, Charlie Netzel, Cao Yi, Joseph Winslow and Jason Hak take a selfie at the Yanqi Lake International Conference Center as they prepare for the PGA Tour Series-China Beijing Championship, Thursday to Sunday. "Carl" Yuan Yechun is out to upset the pros again at this week's 1.5 million yuan ($220,000) Beijing Championship at Topwin Golf and Country Club. The 21-year-old became just the second amateur to win on the PGA Tour Series-China at last Sunday's Qingdao Championship, and the former University of Washington student is eyeing another strong showing in the capital. "I'm still excited about last week's win because it was a long-awaited victory," Yuan said at a media conference in Beijing on Wednesday. "It was a tough tournament and I was very nervous, but I still got it. "The victory was very helpful in giving me more confidence this week, and I also take great encouragement for our preparations for the Asian Games." Yuan has put turning professional on hold as he targets a gold medal for China at the Asiad, which takes place from Aug 18-Sept 2 in Indonesia. "In order to play at the Asian Games, I chose not to turn pro early this year," he said. "I'm participating in the PGA-Tour Series-China to gain more experience." American Charlie Saxon leads the series' order of merit with 811,585 yuan, with Cao Yi the top-ranked Chinese mainland player sitting in ninth with 310,253. With the top five on the money list earning a card to the US-based Web.com Tour, Saxon is keen to consolidate his position with victory in Beijing this week, the third-last event on the calendar before stops in Suzhou and Qinhuangdao. Meanwhile, Australia's Bryden Macpherson, who at 27 is a veteran of three majors, is seeking to ignite his season at a venue where he won his first pro title. Macpherson triumphed at Topwin in September 2015 before securing another win and four other top-five finishes to capture the order of merit crown and earn a return to the Web.com Tour. The Beijing Championship is Macpherson's fifth event on this year's tour, so he's hoping he can rediscover his winning form over the Ian Woosnam-designed course where he also tied for third in an event last year. "I have great memories of Topwin as this was my first professional victory," said Florida-based Macpherson, who practiced at Topwin in the rain on Tuesday. "It was the first time I was in contention and able to really play well on a Sunday. It was a big step forward for me, but it was so long ago that I've almost forgotten how to do it. "The course suits me and fits my eye and my game. It's got a bit of everything - some long holes, some forced layup holes, nice par-3s like No 6, plus the topography's interesting and there's some nice flat holes as well. It tests every part of your game." In another intriguing subplot, Hong Kong's Shunyat "Jason" Hak is motivated by unfinished business - he led for three rounds at Topwin in 2016, when Saxon was crowned champion. "That year I played three really good tournaments in a row before coming to Topwin. I played really well here for the first two or three rounds, and had a one-shot lead going into the last one," recalled Hak, who closed with a 71 to finish fourth. "I actually had a problem with my eye and I couldn't see very clearly, but I still have good memories out here. "I like the tree line and the tough greens. It's challenging, but there are chances you can get out here, and if it gets windy it's going to become a really tough course." Hak was not disheartened by Tuesday's downpour as he seeks to rediscover his early-season form, when he finished fifth in each of the first two events. "Obviously, the weather's not too good right now, but the rain should help things cool down a little bit," he said. "I always look for rain in Beijing because it gets cooler. It has been so hot, and that makes it tough sometimes. "I've been struggling lately, but it happens. Even though I'm frustrated, I just have to move my way back. "Everything has been a little off here and there. I feel like I'm far away, but I'm not, so I'm really just trying to keep myself thinking positively."